Gyeonggi Academy of Foreign Languages(GAFL), located in Uiwang City, held a "VISION 2018 Announcement Event" to declare taking a leap towards becoming "a world class institution." Becoming "A World Class Institution" being the newest goal, GAFL has been quick in gaining the reputation of a renowned high school in Korea during it's relatively short history. Honored and distinguished guests including the current students, teaching staff, parents, graduates and local community leaders were invited this day to celebrate the new vision of GAFL. The event began with a commencement speech given by the board director of the school's foundation, "Bong Ahm Foundation." The speech was soon followed by the vision announcement by principal Jun Sung-eun and members of GAFL, and congratulatory performances. 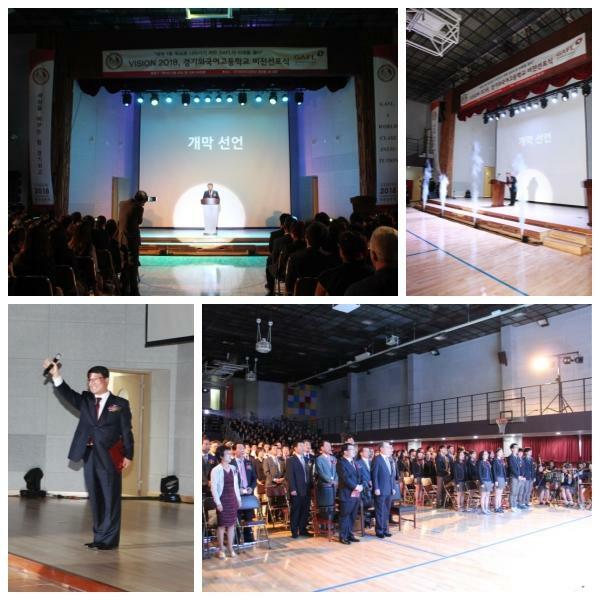 Principal Jun announced that he would "achieve the goal of becoming a world class institute by meeting the students' needs and broadening their choice of tracks by developing a more diverse curriculum, and standing at the forefront of the educational Hallyu(the Korean Wave) by expanding the current International Baccalaureate Diploma Program(IBDP) department to one that will attract students from abroad." The Bong Ahm board director Kang Young-jung had announced GAFL's VISION 2012 "Good to Great," as he first founded the school foundation in order to "educate future global leaders to face an era of change and challenge." Board director Kang's having put in immeasurable support to GAFL's development ever since, has truly helped shape GAFL with great progress and results. In 2014, with the increase of 9% in comparison to the former year, 52.2% of the senior grade students successfully entered the SKY universities(top three universities of Korea including Seoul National University, Yonsei University and Korea University, to which 21, 70 and 50 applicants were each successful in). Also, of the students who applied to SungKyunKwan University and Sogang University, 96.7% were accepted. Gyeonggi Academy of Foreign Languages (GAFL) - 142 out of 272 students who graduated this year had passed SKY (Seoul Univ., Korea Univ., Yeonsei Univ.) entrance exam.